Discussion in 'Epson InkJet Printers' started by Josh Roberge, Jun 29, 2018. I have an Epson WF-3620. Sat idle for 1 year. Turned it on, the colors all printed fine. But Nothing came out of black. I flushed the black nozzle head with water through syringe. All the black ink came out underneath to my paper towel, eventually was clear water after another flush, so I got all the ink out. I ASSUME? I put a brand new black LD cartridge in, ran the Head Cleaning, no black would print out. I ran Head Cleaning two more times, black now comes out, but is printing half cut off. Ran it two more times, no change. It prints black all messed up. -Or do you think the printhead is damaged permanently? -Or that it's the LD cartridge, perhaps a factory Epson one would work better? -Or try another flush with Windex this time? you may do another flushing with Windex, but don't apply too much pressure and first pull at the syringe and then push Windex slowly through the nozzles a few times, scan the nozzle check, just that small part, not the complete page and post it here. You may do one head cleaning after you inserted the black ink cartridge for the nozzle check. a 1 year idle time with pigment inks loaded is definitely a risk for permanent clogs. If you put a printer aside for a long time you rather should insert refill cartridges filled with a cleaner or similar instead of ink. Are you using refill cartridges or 3rd party cartridges in place of OEM cartridges ? Watch the driver that you don't get an almost automatic firmware update . Okay, I will try with Windex this time, and try sucking outwards first, then push the windex through. They are not refill cartridges, they are 3rd party cartridges in place of the OEM. When it does print head cleanings, it dumps the ink in a sponge container in the back right? Won't it fill up if I'm doing so many print head cleanings? Won't it fill up if I'm doing so many print head cleanings? Yes, but that's the price to get such a printer working again - possibly. You may download the WicReset utility which you can use to read the waste ink counter. Okay. Looks like the printer tells you when its full anyhow. My concern was it doesnt and may get too full. Also, some tutorials say that when I insert the solution filled syringe over the nozzle, I should let it sit overnight and let the solution soak before squeezing it through. Is that neccesary? The image shows a typically clogged printhead - no wonder after a year of not printing. You cannot do an alignment in this situation, and there shouldn't be an urgent need at this time if you did a proper alignment at the time of printer setup. Alignment and clogging are not related to each other. There is lots of stuff on internet how to cure clogged printheads, by users, by sellers of cleaning liquids including some miracle stuff - 'removes any clog' etc . The variety of all those proposals and advices shows that there is not one and simple approach to that, and I would not believe some of such promises. I would not keep Windex overnight in the nozzle path, I have not seen any benefit of that beyond something like half an hour. Anybody having more reliable or alternate information how to revive a clogged printhead may join the forum. There is one detail you should look for - whether missing nozzles in the nozzle check print remain at the same place or move around every time you start that print. The Hat and Josh Roberge like this. Okay, I'm just overthinking it. On the Nozzle check, which should I be hoping for- moving around or the same on each test? the best would be that all nozzles are coming back but a complete recovery does not happen in all such cases. There are less likely causes like tiny airbubbles in the ink channels , but it's obvious that those would not go away with any chemically active stuff, so most of it is trying some practices which worked in some cases in the past. I would not keep Windex overnight in the nozzle path, I have not seen any benefit of that beyond something like half an hour. 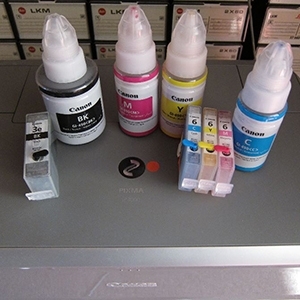 Are Epson print heads different than Canon such that soaking to clear a clogged print head is futile? Along these lines, is Windex harmful to the Epson print head? I am not aware Canon print head is damaged by Windex. Is there a risk of soaking in a solution of water and liquid dish wash soap like Dawn or Fairy with Epson print heads? I recommend this for Canon print heads. The dish soap has enzymes that may do a better job than water and Windex, at least theoretically. I have had nice results with it over a 24 hour soak but my sample size is so small as to be just anecdotal and not evidence against the null hypothesis.